Mama arrived last Sat. afternoon for her second VOM (veterinary orthopedic manipulation) appointment with Dr. Harrison. He recognized a vast improvement right away. "She's walking a lot stronger and is more socially aware," he said. "She's not fearful. She leaned right into me when I started to work on her." Dr. Harrison also noted that her spinal muscles were stronger,the goal he set a week earlier when he saw her for the first time. His initial concern was to relieve stress on her spine caused by her weight. While I was thrilled with the results I can't say I was surprised. Several years ago I had a spaniel-dachshund mix named Ben who became paralyzed from the waist down when he was about 12 years old. A chiropractor who heard of Ben's condition through a mutual acquaintance called and asked if he could treat him. He added that he couldn't charge me because he wasn't a veterinarian, but that he had been very successful with farm animals with neurological damage and old dogs with back problems. I agreed to give it a try. Within 3 weeks, Ben was running on Dog Beach again. Word of his recovery spread. A reporter approached me about being interviewed for a segment on national television. 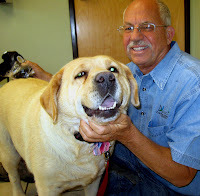 Ben's veterinarian was so enthusiastic with the result, that she also appeared on the show to testify to the effectiveness of the treatment. 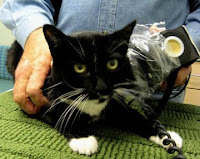 Today, veterinary orthopedic manipulation has entered the mainstream. 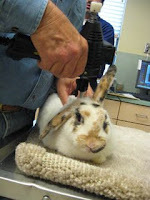 Dr. Harrison routinely works on dogs, cats, birds and rabbits through his association with the San Diego Chapter of the House Rabbit Society. I had to giggle when he described how each pet has their own way of expressing relief from pain. "Dogs start to shake and relax after treatment," he said. "Rabbits will groom themselves. Horses will bend the neck down and lick. "Cats are funny. They will actually push into the Vibracussor because the vibration reminds them of purring. They are not as frightened as people would think." The cost of each treatment is $50. Dr. Harrison says it takes 3 to 5 treatments before the patient will show results. For more information about VOM treatment call Dr. Harrison at (760) 510-8345. You can also call the Acacia Animal Health Center at (760) 745-8115 or visit www.aahc.us.